Despite what is shown on recruiting commercials, life in the army – in any army – is largely made up of long periods of boredom, with the days filled with seemingly senseless, mundane tasks performed at the direction of superiors. The Continental Army, which was formed initially from the New England militia units which encamped outside of Boston in April 1775, was no different. The men of which it was comprised were not professional soldiers, though many had combat experience from the French and Indian Wars, while many others were on their first bivouac. The lessons of camp management, sanitation, enforcement of discipline, chain of command, in short all of the trappings of forming, leading, feeding, clothing, supplying, and fighting the army needed to be learned. When George Washington took command of the Army he learned that there was less than one half pound of gunpowder per man available in the Continental Army encampments, information which rendered him speechless for over thirty minutes, according to John Sullivan. 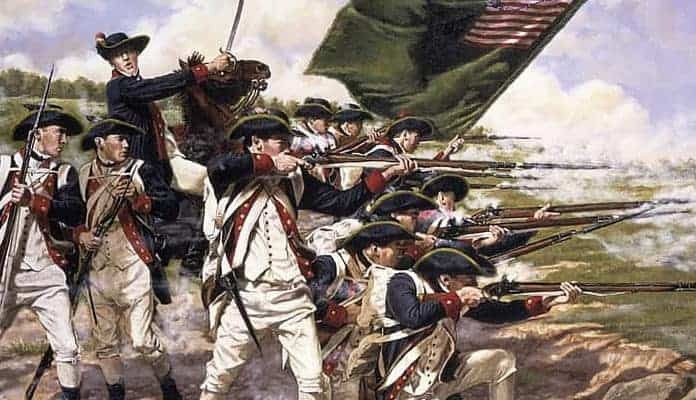 He found encampments which were a hodge-podge of tents; enlisted men who refused to take orders from officers other than their own; a dearth of serviceable artillery; no commissary to speak of; and the fact that the entire army’s enlistments were up on the last day of 1775. From such a shambles it was up to the Virginian to create the Army which would continue in the field for the ensuing eight years. Here are some examples of what life was like for the Continental Army during the American Revolutionary War. The militia units which responded during the Battles of Lexington and Concord and then established the encampments around Boston were from the New England colonies, and their individual towns and counties. In most cases, participation in the militia was mandatory for able bodied men from the ages of 15 up to 45. When Congress formed the Continental Army out of the militia already in place, it de facto conscripted the units around Boston. Congress also established quotas for each of the states to supply troops which would form the regiments of the Continental Army. When Washington arrived at Cambridge he found an army in name only. In truth, with some notable exceptions, it was for the most part an undisciplined mob. The men were mostly bivouacked in tents, comfortable enough in the mild New England summer. Many of the militia companies were officered by men elected to their position, regardless of their level of military experience or lack thereof. The camps were for the most part laid out without regard to the requirements of sanitation, with latrines too near water supplies. Many of the men didn’t resort to the latrines at all, preferring to relieve themselves where they chose. Fighting, gambling, and drunkenness was common among the men, with their officers unable or unwilling to put a stop to it. The men of each state regarded those of other states with disdain, and sometimes outright enmity.